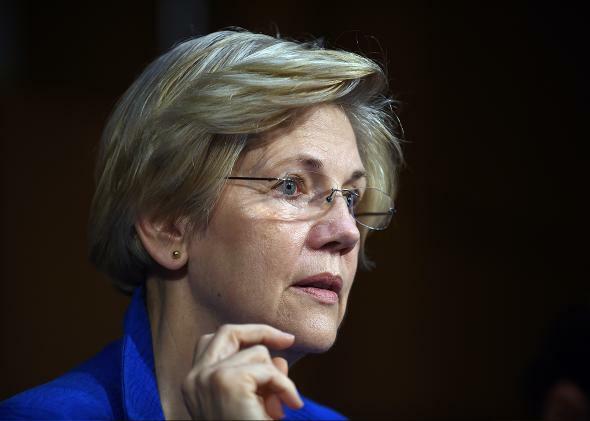 Elizabeth Warren challenged the Brookings Institution over industry-backed research. There’s more where that came from. Elizabeth Warren challenged a think tank over iffy, industry-backed research. There’s a lot more where that came from. Sen. Elizabeth Warren listens during a hearing on July 29, 2015, in Washington. This week, Massachusetts Sen. Elizabeth Warren took her battle against the seemingly limitless power of the financial services industry to that shadowy place where business interests, politics, and academics mingle. Washington is still in recovery mode. The target of Warren’s ire was policy wonk and economist Robert Litan, a former Clinton administration official and—until earlier this week—something called a nonresident senior fellow at the Brookings Institution. Litan came to Warren’s attention earlier this summer, when he co-authored a report funded by the Capital Group, the parent of the California-based American Funds family of mutual funds, taking issue with an Obama administration initiative to increase investor protections for people seeking advice about their individual retirement accounts. Sadly, this sort of financial back-scratching isn’t all that uncommon in Washington. Companies looking to get the government to set rules that just happen to benefit their bottom lines often seek out wonks looking to supplement their pay who will make arguments on their behalf in a dispassionate way. The resulting work isn’t submitted to academic journals, which means it doesn’t need to go through a rigorous peer-review process—or any peer review at all. So it should surprise absolutely no one to discover that Litan and co-author Hal Singer’s work supported the Capital Group’s nyet position on the administration’s proposed protections. Litan then went on to testify about his findings—which Vox’s Dylan Matthews described this week as a “pro-industry hack job”—at a congressional hearing on the proposed rule change this past summer. His Brookings affiliation was mentioned in his written submission. So too was his sponsorship by the Capital Group. Three cheers for Elizabeth Warren or whichever member of her staff first spotted this arrangement, at which apparently no one else blinked. They began to ask questions and quickly discovered that even though Litan and Singer swore that the Capital Group’s payment of $85,000 (of which Litan received $38,800) had no influence on their findings, this money in fact entitled flunkies from the financial services firm to the traditional privileges of an editor. This editorial work included “feedback on our initial outline and some editorial comments, plus a few citations in the literature to follow up,” Litan helpfully explained. Case closed? Not exactly, and, no, not just because Litan is claiming Warren “bullied” him while Singer has gone on a Twitter rampage, defending his work and co-writer alongside the hashtag #McCarthyismOfTheLeft. The financial services industry has long sponsored quasi-official academic studies, which it uses to influence both public opinion and politicians in Washington. In 2010, the late magazine Smart Money took the issue on, focusing on David Babbel, a professor at the University of Pennsylvania’s Wharton School of Business who took money from New York Life Insurance Company to study annuities. He promptly—with several co-authors—churned out a report recommending said product as the answer for what to do with a lump sum of money at retirement. Do you really need me to tell you which company happens to sell annuities to seniors? Other financial services firms have even set up their own think tanks, like Allianz Global Investors, which founded the Center for Behavioral Finance in the wake of the financial crisis and promptly began sending its reports to the Labor and Treasury departments. When asked, all these people—like Litan—say the academics involved are not required to produce particular findings. That’s a deliberately obtuse response. Purveyors of business as usual can scream all they want that no one has proven a quid pro quo, but no one, outside of a Hollywood movie, signs a contract promising all sorts of secret stuff. You’re supposed to know what to do. If you don’t or no longer care to perform on command, you are highly unlikely to get such a gig again. Just ask Lewis Mandell, a former board member at the JumpStart Coalition for Personal Financial Literacy as well as a professor emeritus of economics at the State University of New York’s Buffalo campus. For about a decade, Mandell was one of the main academic faces of the financial literacy movement, faithfully churning out studies showing that American students didn’t know a credit card interest rate from a student loan bill. Only one thing. Mandell also discovered that the classes the financial services industry was promoting as a fix for this pressing issue didn’t make a difference. When he began to publicize that data, JumpStart, which receives a huge chunk of its funding from the financial services industry, cut Mandell loose, as I reported in my book a few years ago. Of course, this sort of stuff isn’t just a problem in the banking sector. You can find it almost anywhere. Just last month, the New York Times highlighted concerns over the appointment of world-renowned cardiologist and researcher Robert Califf to head up the Food and Drug Administration. Califf received pay for consulting services from seven pharmaceutical companies between January and September of last year alone. The food industry is known to play this game too, with Coke sponsoring research that claims to show that poor diet—something that often includes excessive consumption of soda—is not responsible for weight gain. Do some people manage to take the money and remain on the side of the angels? Surely some do. But we’ll never know for sure. As a result, not only do all those funds frequently buy results from academics, but they buy something less desirable too. All this cash, all these sponsored studies both cause and compound the corrosive cynicism that’s eating away at our communal political culture, leaving us distrustful, angry, and willing to support almost anyone we think might tell us the truth. On a good day, that’s Elizabeth Warren. On a bad day, it’s Donald Trump, reminding everyone how he opened his wallet and—voilà—Bill and Hillary Clinton decided to attend his wedding to his third wife. Voters aren’t stupid. They get no company is doling out money repeatedly for the privilege of hearing someone disagree with it. Does anyone in Washington besides Elizabeth Warren understand that?